This iPhone app could potentially detect skin cancer, but would you let it? 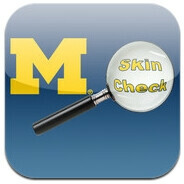 Straight from the University of Michigan comes UMSkinCheck – an iPhone application that is meant to detect skin cancer. In a nutshell, the software tracks suspicious moles and lesions for you using the smartphone's camera. Sounds amazing, doesn't it? Well, the app could potentially save your life, although the way it works might make you think again whether using it is a good idea. In order for UMSkinCheck to come up with a diagnosis, it needs 23 photos of you in your birthday suit. What's more is that a partner to take the photos will most likely be required while you are striking poses for the camera. So yeah, basically you will carry around naked photos of yourself on your smartphone, which is probably the last thing you want prying eyes to discover. Still, if you are more careful with who has access to your iPhone, UMSkinCheck could be a good alternative to whole body photography, which usually requires a professional to handle the shooting. But at the end of the day, would you really trust an iPhone app to diagnose such life-threatening conditions? Could a piece of software really be as good as a doctor's verdict? Let us know what you think by dropping a comment. Was this the app Created by the Michigan football team and only applicable for males aged 10 to 16?